So, my main inspiration for wanting to provide these quiet books for my girls is because my mom had made them for us as kids. She actually surprised me one time when she came to visit and brought the quiet books for my girls to now use. I can't tell you the memories that came flooding back with each turn of the page of this book. If you asked me what was in it beforehand I wouldn't be able to tell you but as I was looking through it the first time in probably two decades I now remembered every detail and a new desire was placed in my heart....to create those same wonderful memories for my girls. So, with much love I wanted to show you the first of two quiet books from my childhood. This is the Old Testament quiet book. Here are the Noah's Ark and Tower of Babel pages. Here they are in action. 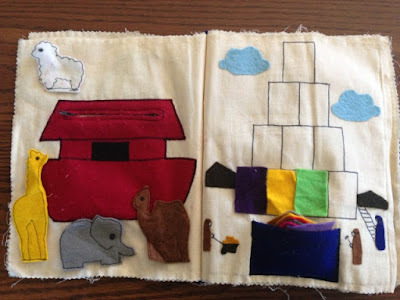 Noah's Ark unzips to reveal some animals. And the Tower of Babel has blocks in the pocket that you take out to build the tower. 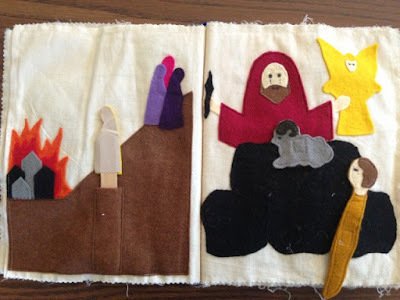 Here's the story of Lot & Sodom, and Abraham & Issac. In this page Sodom is burning and Lot's wife turns around and get's turned into a pillar of salt (white sandpaper). 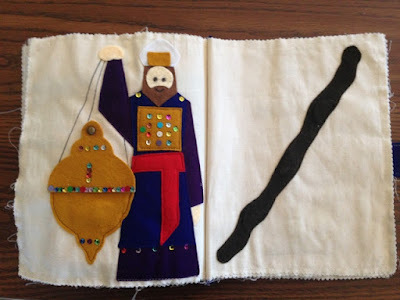 In the Abraham & Isaac page Isaac is removable and the ram is removed and takes his place as the sacrifice. 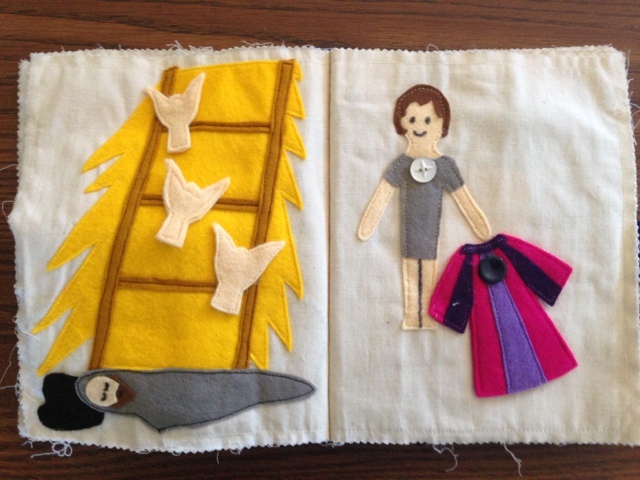 These are the Jacob's Ladder & Joseph Colored Coat pages. 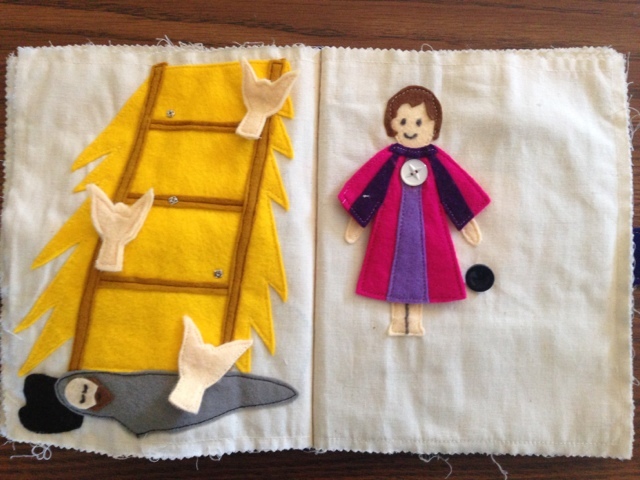 On the Jacob's Ladder page the angels all remove on snaps and Joseph's coat buttons on and off. 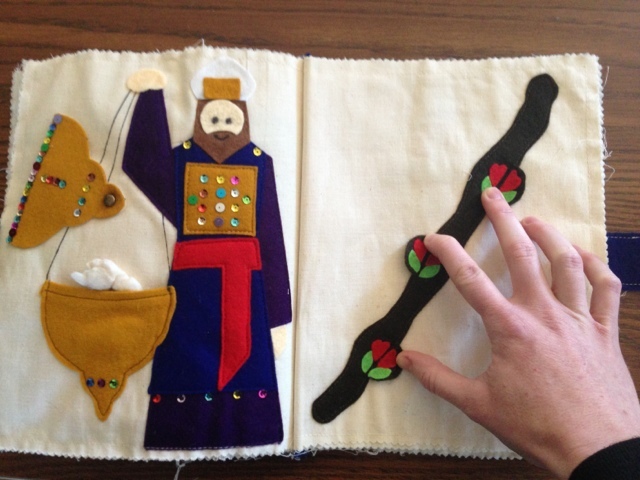 These pages are about Moses. 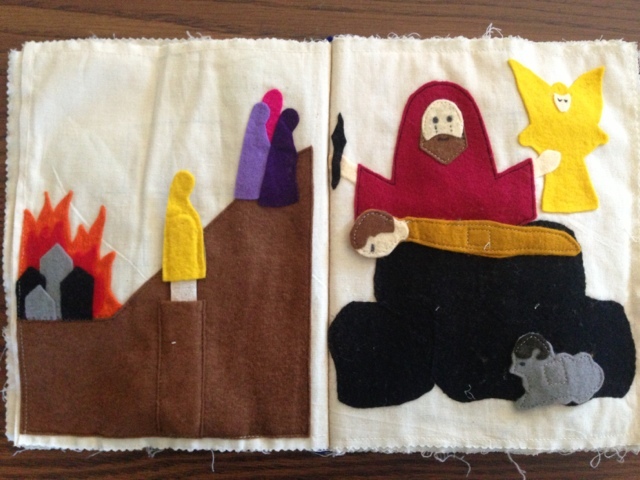 The first is him as a baby in the reeds and the other is when he talks to God by the burning bush. You can flip down the grass reeds to reveal a baby Moses in a little basket. I'm not sure if there ever really was a baby but ever since I can remember it had just this little printed paper of a baby. 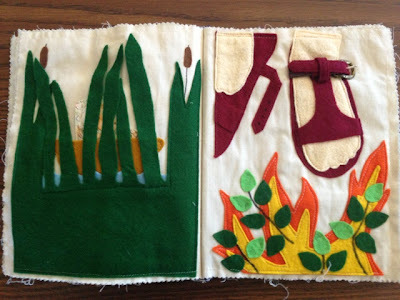 The other page shows the burning bush. When he was there God told him to remove his shoes because he was on Holy ground, so you can remove the the latch on the sandal. These pages are about the priests of the temple and the rod of Aaron. The priest page has a removable jar lid that has a cotton ball with a perfume on it so you can smell it. Pardon my hand on the next page there was no way to photograph it without holding them open. But this is the rod of Aaron that blooms from the story in Numbers 17:8. This next picture is of the story in Numbers 21, where the the Israelites were once again grumbling and complaining God, so he sent some snakes to bite and kill most of them. He told Moses to make a bronze serpent and set it on the pole and anyone who was bit could look to the serpent and live. (This blog has a cool explanation of the weird but interesting story in the Old Testament). Well, there you are. A wonderful an amazingly fun Old Testament Bible Quiet Book for you. My mom isn't sure what the name of the pattern was she purchased to make this but there was a pattern. But she made this in the 80's so not sure if we'd ever find out where she got the pattern from. But if anything it will give you ideas to start this wonderful journey of quiet book making! 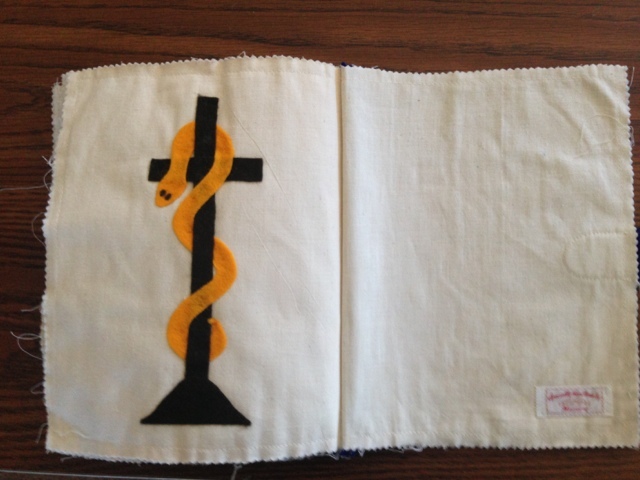 Hope to be posting the New Testament Quiet Book my mom also made soon! So, check back! 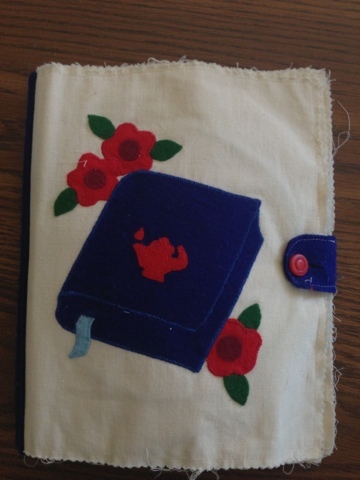 Thank you for posting pictures of your beautiful quiet book. Do you know where I could find the pattern? I would like to make my kids a quiet book for Christmas, and would love to make them this book (and the New Testament book, too!). Thank you! 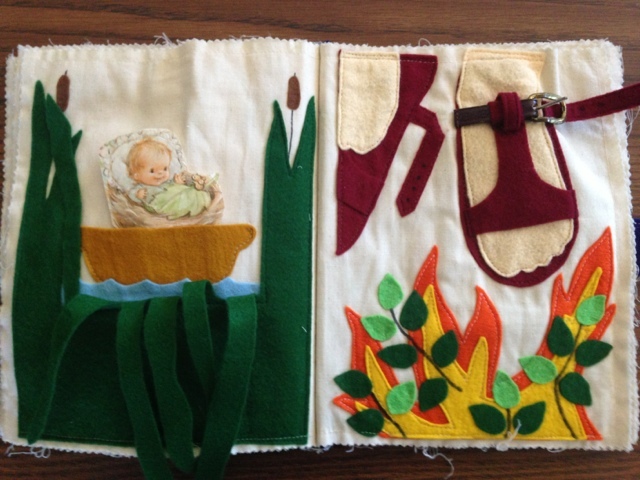 It was so many years my mom made these quiet books for us she doesn't remember where she got the pattern. She only remembers the many hours during our naps spent putting it together. It's amazing how it's held up all these years. I'm sure you could draw and make your own pattern. It may be more time consuming but totally doable. Sorry I couldn't be more help. Thank you so much. 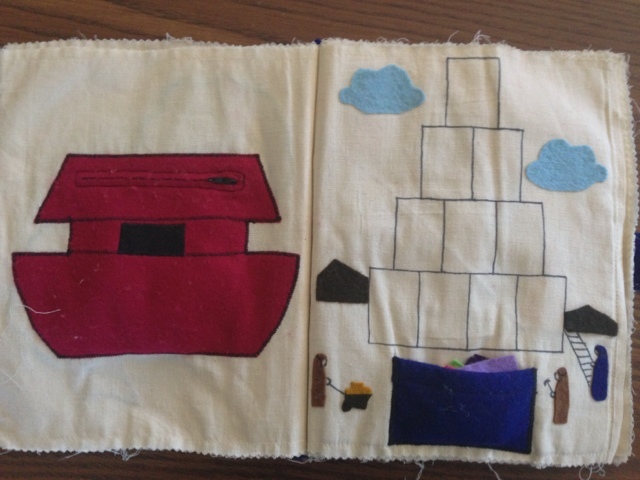 I've been making progress on the quiet book and have made a few of the pages into patterns by enlarging them. So far I have the Jacob page and the Good Shepherd page. Thank you so much for posting your beautiful book online. I hope my kids love it as much as you lived yours!